You might remember this from a while back when I posted a blog entry after attending our members gaming event at the Retro Computer Museum and the unveiling of ‘Dr Phu’s’ homemade 21″ Vectrex monster console….which I think we should now call Frankentrex. 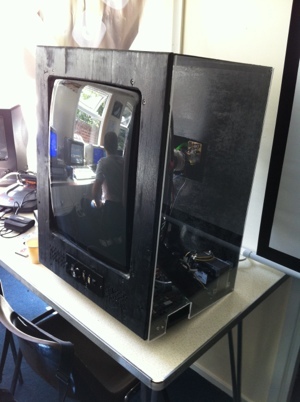 21″ Vectrex in DIY case with clear side panel so you can have a look at the beast inside. Phu (Richard) is a bit of a tech wizard like most of the chaps at the museum and thought it would be fun to see if he could take the innards of a faulty Vectrex console and figure out how to get it to work on a 21″ tv tube. He had this working just prior to last years event but sadly, something went pop and the chaps and I never got to see it actually work. However, back to the drawing board after many months, funds and parts acquired to continue the project. It’s still early days yet but Phu’s latest video is looking promising. Hopefully it’ll be ready in time for the next RCM event at the end of August – I’m looking forward to testing it out for myself. This entry was posted in MB Vectrex and tagged DIY Vectrex, MB Vectrex, retro gaming. Bookmark the permalink. Thanks bud. Yeah,the Vectrex will always be a bit special to me too. Do you have many games yourself?